Enterprise IT pros share their disaster recovery stories. Following a crazy year that saw hurricanes, wildfires, earthquakes, and man-made disasters disrupt life and business across the globe, disaster recovery, resiliency, and emergency communications has taken on a new level of importance within the enterprise. Fortunately, technology advances and increasing adoption of cloud communications, remote work, and texting provide new options for ensuring infrastructure resiliency and services continuity. And a little planning can go a long way toward keeping things running, both for your internal employees and customers who might be calling into your contact center for assistance. Such was the message four enterprise IT professionals emphasized in sharing their disaster recovery and business continuity stories. As their stories demonstrate, planning today for what may come tomorrow is not only the smart, responsible approach to ensuring employees have a way to work and keep the business running, but also critical for situations in which the general public may need to reach your contact center for life-or-death assistance. You probably remember Irma, that category 5 hurricane that plowed into Florida last September. Irma had a penchant for changing its trajectory, making a disaster recovery action plan particularly challenging, as Henry Marr, senior VoIP administrator and developer with South Carolina Federal Credit Union, shared in a session at Genesys CX18 last week. For the credit union, the largest in the state with more than 400 employees and 150,000 member accounts, a lot of the planning came down to leveraging real-time communications, he said. When Irma was still a tropical storm, Marr and his team began tracking its trajectory. 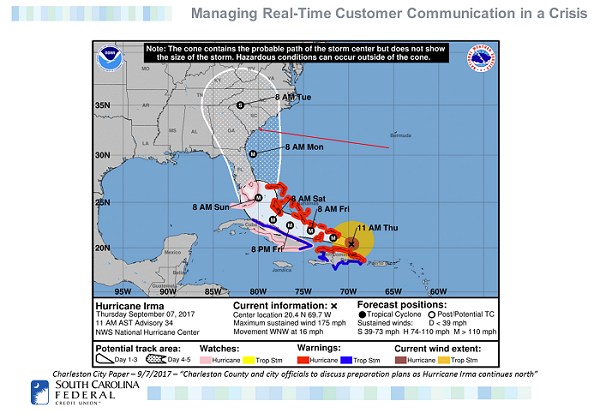 With estimates on Sept. 7 showing Irma due to hit the southern portion of South Carolina, credit union executives decided to make Sept. 8 a half day to allow employees to prepare for the impact, and leveraged the Genesys PureConnect SMS platform to send out that notification. Alerting members to the early closing via SMS also was critical, since storms like Irma often knock payment systems offline and cash becomes king (in fact, the Department of Homeland Security recommends having at least three days cash on hand for emergency scenarios), Marr said. "The safety of our membership is our primary concern," he added. "Being informed [on closures, etc.] allows them time to make financial arrangements in the face of uncertain circumstances." Even though Irma changed directions and didn't hit South Carolina as expected, the lessons remain, Marr said. SMS provides a more efficient medium of communication than voice because it removes the worry about whether your telephone lines are going to be available, Marr said. The credit union quickly organized its SMS outreach campaign, and sent 70,000 messages to members in a period of roughly two hours. Just weeks before Hurricane Irma hit the eastern coast, Hurricane Harvey plowed its way into the Gulf and parked itself over the Houston metropolitan area. 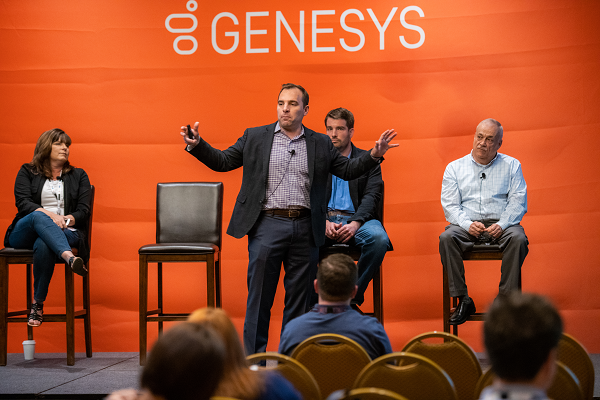 Akyta, the advisory services arm of Entrust Energy, headquartered in Houston, is particularly proud of how it weathered the storm, with little impact to its customers, with the help of a cloud contact center, as president and CEO Carl Williams shared at Genesys CX18. 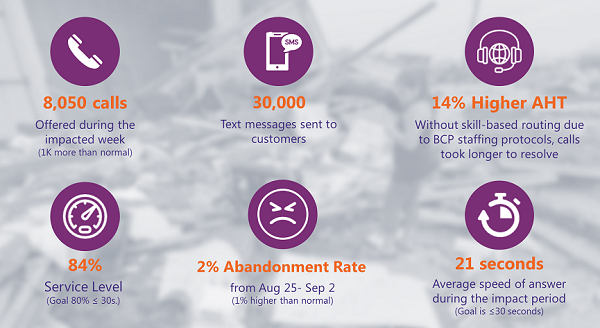 To help handle increased call volume during the storm, Akyta relied on its near-shore operations in Nicaragua. By leveraging Genesys PureCloud for call routing and the company's proprietary CRM/billing solution that was also cloud based, implementing the near-shore operations only took a matter of days. Akyta enlisted the help of 39 agents operating out of the near-shore location, with many of them volunteering for overtime every day. Akyta had daily conference calls between its two centers so everyone could be regularly updated on the situation. Its team performed an evaluation of the hurricane's potential impact to facilities and staff, and published new staffing plans, with agents in the near-shore facility quickly cross-trained to handle anticipated increased call volume. Further, agents received live feeds of the hurricane, so they could understand situations customers were calling about and better empathize. Subject matter experts, trained to deal with special situations like this, were made available for online consultations via the use of Wi-Fi hotspots and laptops, Williams said. Akyta employed text messaging and email to send daily updates to all staff and stakeholders. On the customer front, Akyta texted and emailed customers advising them that phone lines were open and the team was there to help. The company added messaging on inclement weather conditions causing high call volumes to its IVR and website, and similarly pushed messaging out through social media channels. The company was able to carry on with near-normal operations, Williams said. When disaster struck in New York City, the Human Resources Administration (HRA), which is part of the city's Department of Social Services, was able to carry on with near-normal operations, too, thanks to its advanced preparedness. NYC's HRA, which lays claim to being the largest social services agency in the country with roughly 16,000 employees, provides benefits to more than 3 million citizens from 75 sites spread across the city's five boroughs. From these centers, serviced by Avaya contact center technology, HRA supports programs for food assistance, Medicaid, and emergency rental assistance, among others, Prashant Thakker, deputy CIO of NYC HRA, told me in a recent interview. All employees need to be physically located in a center during business hours in order to handle the agency's walk-in clientele, he added. Being in social services, dealing with a disaster scenario is "much, much harder" than for many commercial businesses, Thakker said, as it's not just employees who are impacted but the general population that HRA is charged with helping. "We leverage our physical sites to address our clients and extend our services to them, so from the business side, those workers are obviously dependent on the IT and the network." As a key element of its disaster recovery strategy, HRA relies on a redundant private fiber network and VoIP, Thakker said. Employees can work from any other location should their primary office become available in the event of a disaster, Thakker said. All they have to do is use existing phones to take calls, he said. The organization's disaster preparedness was tested in 2012 when Hurricane Sandy hit the East Coast. "It was a very proud moment for us in how we handled it," Thakker said. When the storm caused flooding that restricted access to certain offices, the agency was tasked with moving more than 2,000 employees to different locations. All executive staff moved to the organization's Brooklyn location -- which had not been officially opened for business up to that point -- and the new site was stood up in 48 hours. "It went well because of the VoIP lines and georedundancy," Thakker said. HRA has had to make similar moves several times over the years for flooding or just in moving workers around from one location to another, but Sandy was the biggest natural disaster through which the agency has had to navigate. With its own communications network in place and the ability to scale up to 150,000 endpoints, HRA had planned enough in terms of availability to see itself through the storm. Every business, at one point or another, will face an outage scenario. But what happens when a disaster strikes and you're a business that needs to be accessible 24/7/365? This is the case with CareFirst BlueCross BlueShield, as Tommy Flow, lead VoIP engineer for voice and data at the company, shared at Genesys CX18 last week. CareFirst is an independent licensee of the BlueCross and BlueShield Association, with 1,100 call center agents handling inquiries from 3.2 million individuals and groups in Maryland, D.C., and Northern Virginia. When a 2014 snow storm over a holiday took those agents offline for four days, CareFirst suffered significant backlash from customers, Flow said. After this situation, the company's CEO dictated that the call center would never close again, and executives put a disaster recovery and resiliency plan in place to ensure business continuity regardless of bad weather, power outages, or any other major disruptive event. 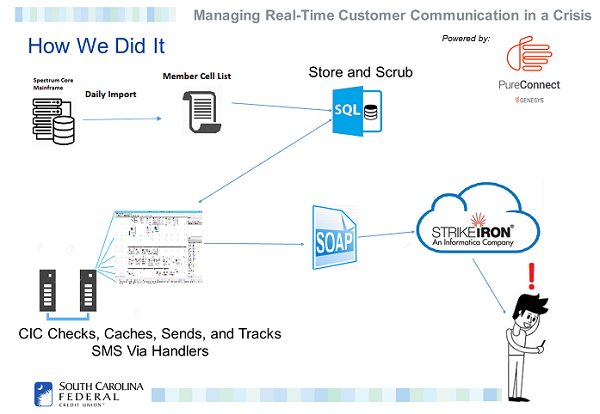 CareFirst, a Genesys PureEngage customer, had implemented SIP in 2013 to support those 1,100 call center agents, Flow explained. After the mandate to stay open, 750 agents received what Flow called a "teleworker all-in-one system" so they could continue taking calls from home during events that prevented travel to or occupancy of their assigned CareFirst facility. Each kit includes an all-in-one LG Zero Client that supports Genesys Workspace Edition, a video demo, and documentation showing workers how to assemble and wire connect to their Internet modem at home, a Plantronics headset, and a bag containing a keyboard, mouse, surge protector, and 15-foot Ethernet cable. While CareFirst put together these at-home systems with business continuity in mind, and only for disaster scenarios, the company is now considering extending this approach to other use cases, Flow said. For example, an all-in-one teleworker system could provide more flexibility for agents who have a sick child to care for, for example, or as a benefit for agents who are meeting their goals. As these diverse enterprise stories show, the flexibility and agility that comes with cloud deployments, VoIP, and SMS may make it easier for enterprises to cope in disaster scenarios. No matter the technologies you select, the key is to plan ahead and be prepared to spring into action when the unexpected occurs.